The Application Deadline for Jewish Studies Administered Research Awards is Friday, April 8, 2016. Apply today for travel, living expenses, tuition, and research equipment and supplies. Each fall and spring the Jewish Studies Program offers Goldfein Research Awards and the Brenner Special Opportunity Awards to both undergraduate and graduate Penn students. 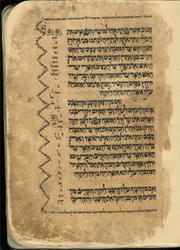 "Taj" - Yemenite Pentateuch containing Leviticus, Numbers, and Deuteronomy. 1509. Fol. 3 recto.